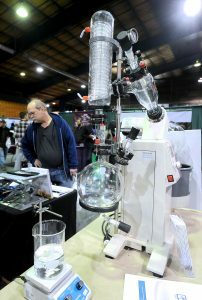 A rotary evaporator for distilling THC and CBD from cannabis is on display at this year’s THC Fair in Central Point. The Hemp and Cannabis Fair playing this weekend at the Expo saw a 20 percent drop in vendors compared to its last appearance here in September 2018, but plenty of new products are on display at the event to pique the interest of cannabis growers, sellers and consumers. CBD lotions, balms and elixirs for seemingly every purpose are on display at virtually every other booth Saturday. CBD, the acronym for cannabidiol, is a non-psychoactive component of both hemp and marijuana that is being touted for a wide range of medicinal uses. “We’ve even got an oil for your fur babies,” Keith Richards, with Anza Cali Raw Green, said at The Magic Dragon dispensary booth. Richards said his business, based in Riverside County, California, has seen “an explosion” since January — now that hemp is legal in all 50 states. 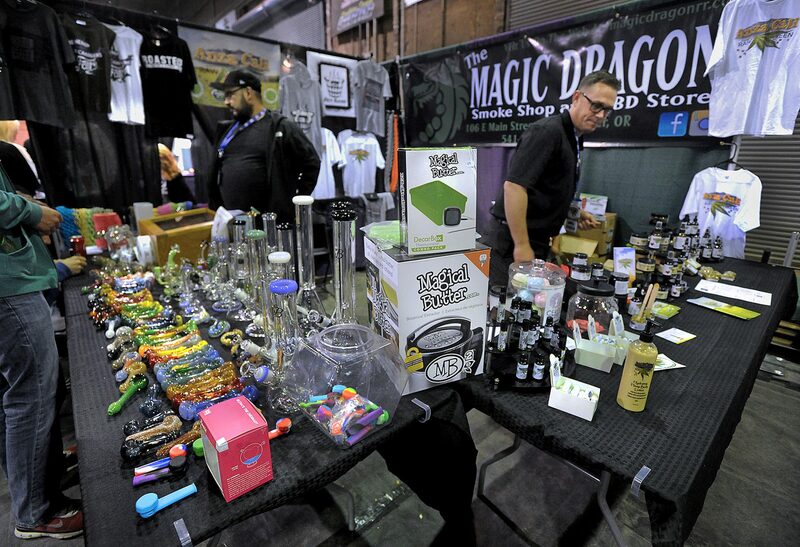 The Anza Cali and Magic Dragon booth was one of about 80 vendor spaces showcasing dispensaries and equipment dealers serving the hemp and legal marijuana industry, according to THC Fair Director Naomi Forkash. Forkash said that “a huge surplus” of recreational cannabis grown two years ago in Oregon damaged “a lot of really good businesses,” but the industry is starting to stabilize. However, Gordon also said she’s seeing customers start to value quality and consistency over price alone. “They’ll find that company they really like and roll with it,” Gordon said. She opened a bag of Komodo Dragon from Avitas Farms, one of about 50 flower strains the dispensary sells. “Look how beautiful this is,” Gordon said. In addition to vendor booths, the THC Fair offers talks and presentations on various topics related to cannabis commerce. Kathy Tobin and her business, Applegate Valley Herb Company, made their debut at the THC Fair Saturday. It took a year for her to dial-in formulas for her products, such as her Calendula CBD balm — first made for a friend who had radiation burns during breast cancer treatment — among other lotions and products, such as CBD Bubble Bath Bombs. She said she hears stories on Facebook about the health impacts of her products. “It’s really nice to be able to help people,” Tobin said. Forkash described hemp and CBD as “the in-thing right now,” because the crop isn’t as heavily regulated, and can be sold across state lines. “It’s just easier to manage,” Forkash said. The THC Fair continues Sunday at the Expo from 11 a.m. to 4:30 p.m.